Check out this incredible Dogman story. Shel Kaoke Dion is a Bigfoot Researcher who lives in Central Illinois. She used to enjoy being in the field, spending time around the Sasquatch in her research areas. The fun stopped when Dogmen moved into the area. Now that Dogmen have moved into her area, Shel has to be very careful, anytime she ventures into the woods. She even has to be on alert around her own home! Shel and her family have had multiple Dogman encounters. I'll relate this story, and you can take it or leave it, that choice is yours. About 20 years ago, I lived on and was in charge of a heavily wooded and pretty wild private campground that was primarily open during the summer, and then only open weekends afterwards, until the winter months when it closed down. After summer camp ended in the fall, I would take strolls out into camp on full moon nights. I did this for a particular reason, and that was because, the local kids knew that camp was shut down, so they'd drive over and park in a meadow at the far side which was located near the end of the main driveway. They'd party, smoke it up, drink and have a good time out in the middle of nowhere. I would basically use the shadows, that a full moon provided among bushes and trees, so I could sneak up on them, get their license plates and report them to the local law. Yes, I seem like a prick, but that was my job and I saved many thousands of dollars in property damage by doing this. One full moon night, as I made my way down the driveway to the meadow at the end of it, I crossed another drive that turned off to one of the several lodges on the property. Since I had passed this drive dozens of times on full moon nights before, I was very aware of what it looked like after dark. But this time as I peered down the drive in the darkness, something caught my eye in the shadows, about 30 feet from where I stood. I stopped at the entrance to the drive, and looked at this -- for lack of a better term -- this something that looked to be crouching in the center of the drive. Although the moon was full, and there was usable light, whatever this was had positioned itself in the shadow of a huge tree, so although I knew something was there, I could not really make it out. I started deeply at what was 30 feet from me, and it looked like, whatever it was, was looking directly back at me. I mean, just the way it was posed, it looked like it was staring back at me while I was staring back at it. But I could not, for the life of me, make out what it was. Could it be a dog? A coyote? A wolf? It certainly had a canine appearance in the way it sat on its haunches, but it just looked like something different. Well, dark or not, I wanted to know what this was, even if it was just a strange shadow caused by the moon, a branch that had fallen, or whatever, so I cautiously began to move down the drive towards it. I knew that any dog or coyote would get the hell out of there as soon as I got close enough, so I was unafraid when I began walking towards it. When I advanced about 10 feet, I suddenly stopped because I could almost make out a distinctly human type of shape. The problem was, it also looked hairy and not wearing any clothing, and it really began to look like a giant canine, sitting on its haunches, just watching me. I'm 6 foot tall, and just sitting there, this thing looked like it was coming up past my waist. Whatever it was, if it stood up, I realized that it was going to be taller than me! At that point, I had enough, and slowly backed away down the drive, neither it nor myself breaking the gaze we had on each other. I still half believed that, whatever it was, may have been a downed branch or something, but I didn't really want to find out about it in the darkness where I couldn't see very much. So I backtracked, got back out to the original driveway, and continued on with my patrol. After about an hour or so, when I had finished wandering around the meadow, I came back down the driveway in the opposite direction in which I had come in the first place. At the drive that went to the lodge, I stopped to take a look and see if that "thing" was still there sitting on haunches. It was gone, and that really gave me the shudders because, that proved that whatever was there initially, was decidedly real. Just to make sure, I carefully went all the way down to the spot where it sat, but in the darkness, I could find no trace. And sure enough, there was no bush or branch or anything else that could account for that shadow, so whatever it was, had to be real. I even came back the next day in full daylight, and I checked the whole area over looking for tracks or anything that I could find. What I did find, a few feet away and in the grass, was a dead and torn apart rabbit. There wasn't much left of it, some bones, fur and the skull, and truthfully, I don't know if that was related to this "thing" or what. I lived at that site for several years, and never saw anything like that again. But, I did find out about a local creature, and it's called The Beast of Bray Road. Look that up, and you'll see that the "beast" is classified more-or-less as a dogman type of creature. Bray Road is about 5 miles from where I was living at the time, and between my camp and Bray Road are fields, woods, lakes and a lot of wide open country. Now, although I have no proof, I half wonder if I was visited by The Beast, and quite possibly, had I advanced and disturbed it from a meal, I may have been lucky to make it out of that encounter unscathed. I'll never know, but it creeps me out to this day. Oh and, by the way. I never did a foot patrol at night again. From then on, I always took the camp truck, just in case. Sir - I would like to pass along a true story told to me by my grandfather when I was a young man. The story involves my great-grandfather, whose name was James McNamara. He was a patrolman in the New York City Police Department. This incident occurred in October of 1911 during the late evening hours. James was assigned to the theater district, in the area of Broadway and 42nd Street. Another patrolman, by the name of Dobbins, was two blocks south on Broadway near 40th Street. Theater goers were walking about and enjoying the 'Great White Way' when suddenly there were screams emanating from an alley-way just below James' position. Both patrolmen ran toward the ruckus, forcing their way through hundreds of fleeing pedestrians. As they reached the alley-way, a tall hairy beast ran out onto Broadway and towards 40th Street. Neither patrolman could believe what they saw. An eight-foot tall wolf with human-like arms and legs, running with skill and speed down the middle of Broadway. Soon the beast was facing a NYC Packard squad car, so it changed direction and moving back towards McNamara and Dobbins. The beast was growling as it moved forward. The patrolmen took positions by a news stand, hiding and waiting for the horrible creature to move before them. Soon the beast was at the entrance of another alley-way near 42nd Street. Both patrolmen pulled their revolvers and took deadly aim. The beast quickly dropped to the gutter. Immediately McNamara and Dobbins surrounded the body as other officers joined them. None of the public was allowed to come within 100 feet of the unknown canine. The body was quickly removed and taken to the mortuary. Both patrolmen were placed on other assignments. The squad was told by their superiors that this was simply mistaken identity an that the deceased was a man in a costume. Of course, that was not the truth. The press was later told that a 'large mad dog' caused the disruption and that none of the public were injured. Very interesting story. I had never heard of it before but I just looked it up. People describe it as a werewolf type creature or a variety of Bigfoot. I would say you are lucky to have seen it and more lucky to be alive. Bigfeet have been known to kill when provoked. Have any deaths been attributed to this Bray Road beast? I never heard of any actual death by the Beast of Bray Road, but the local paper used to run stories of this thing scaring off people, attacking cars and in one case, jumping on the hood or bumper, leaving scratches. Linda Godfrey, famous paranormal/crypto researcher, who was with the paper at the time, began to research people about "The Beast," and they told her all sorts of strange encounters. Many of them were about this thing crouching down next to the road as people drove past. I may be wrong about this, but I believe that Godfrey was forced to leave the paper, and the area, because she had uncovered so many reports that she, and the paper, became ridiculed for sensationalist stories! I mean, I lived in that area for about 12 years, and although the stories never stopped, the reports did. It has now become only a local phenomenon that won't get printed in any paper, Internet or TV reports, but the Beast still is around and the people in that area talk about it all the time. As for me, I never knew about this thing until after whatever-it-was was in the driveway going to the lodge. It was somewhere after that when a Godfrey penned report about the Beast came out, and it was like i get whacked upside the head by a hammer. I read the story and said, Holy S..T!!!! It was at that point when I began to think that maybe what I encountered might have been IT! The "beast of Bray Road" is near Elkhorn, Wisconsin, and one of our members, Paulette, lived there for a time. I believe she has touched on the weirdness of that area. Having been to Wisconsin this past summer, 2015, I can verify that there are still a lot of lonely country roads, with either mis-marked signs, or no road signs at all. And 'swampy' areas, almost out of nowhere among idyllic corn fields. It was beautiful. (but beautiful in the way that you can picture the Hansel and Gretyl story coming to life as you suddenly find a house made of "candy"). Having run around old country roads the first half of my life, there is a difference between unknown country road, and downright spooky country road. I stayed near our cabin every night in Wisconsin. The Beast of Bray Road is probably the most well known weirdness in Wisconsin, but the Holy Hill beast is also known, at least around those parts of south-central Wisconsin. I've give you a URL about the "beast" that stole a deer carcass from a pick up truck. It appears as though a contracted worker by the state goes out to get road kill nightly, and one early morning, some creature hopped in the back of his truck, picked up a carcass and jumped back out. Now, say what you want about this, and most people say it was a bear, but there are no bears around that part of Wisconsin, plus, bears are incredibly nosy and they'll sniff around for a long time, especially when humans are present, before making a move. This beast apparently came right up to the back of the truck, vaulted in, picked up the carcass and vaulted out! And if you think that's easy, try lifting up a 140 pound deer and go jumping around with it on your shoulder. A bear might drag something like that out of a truck, but it won't leap out like this beast did. Also, for grins and giggles, copy and paste this into your browser, holy hill creature steals deer carcass and you'll get a ton of stories about this incident and others. I've lived rurally in Wisc, most of my adult life, and there is some pretty strange stuff going on in this state. And so it goes. It's my feeling then that Wisconsin has some cool dudes living there. Hope you can stick around here awhile! I loved Wisconsin. Had no idea whatsoever that it wasn't just "another boring state". Like Missouri (where I hail from, though I was born in Kansas). You can get this from reading my disjointed, distracted posts - I live in rural Missouri the past 2 plus years, but have lived in the city most of my life. Both my parents are from "farm people", so tho we HAD to live in the city (my dad was in employ of city government), we were at some "farm" nearly every weekend and every summer. Its all pretty real to me, as I once again live with the folks . . . But enough about me . . going to check out those URLs. Thanks! There is all sorts of strangeness in virtually every state, it's just a matter of keeping your ears and eyes open. I grew up on the far southwest side of Milwaukee, Wisconsin, which was adjacent to farm fields and a lot of unused land. In fact, about 3/4's of a mile from my house, just outside of city limits, was a herd of cows. You could literally walk down a sidewalk, and where it ended, the farm began. The big joke about strange animals being out and about were kangaroos! I kid you not. Every once in a while, someone in my neighborhood would call the cops and report a kangaroo hopping around. In fact, one night when I was about 15 years old and out with several buddies, we rounded a corner and saw something hopping/running through the neighborhood front yards. We all yelled out, "It's a kangaroo!" but it could just have been a really big dog as anything. I told my Dad about this and he answered without any surprise at all, "Sure, everyone knows about the kangaroos." Reports came in so frequently, that the county of Waukesha, which is right next to Milwaukee, became known as "Kangaroo County." Here's a story with an actual picture of a kangaroo taken in Wisconsin. ~~~ extraordinaryintelligence.com/the-elusive-american-kangaroo/ ~~~ Kangaroo county prolly never made national news, but we folks in Wisconsin knew all about it. It was no secret to us. Of course, everyone on the outside just kind of poo-pooed all of this, there is no way kangaroos can be in Wisconsin, mostly because the winter there would kill them off, people are making this up, they are drunk, hallucinating or just plain BSing. It's Wisconsin, after all, cheesehead hick state of the Union! Kangaroos in Wisconsin? You betcha!!!! And so it goes. I've heard about the kangaroos. We even supposedly have some hopping around down here in certain parts of Texas. Many years ago somebody even took a picture of one of them staring at him out of his cornfield. There's no telling where they all came from or how many there really are. There are other reports of out-of-place critters in other areas too. Camels that wander the deserts of the southwest (leftover from a doomed civil war project), monkeys in Florida (leftover from the old Tarzan show they filmed back in the 1950s), a hippopotamus that was found in a Texas town named Hutto (nobody knows where the heck that one came from), and other stuff like that. I don't know of any living animal that could be mistaken for a dogman though...unless it's a bigfoot...or a werewolf. I'm pretty skeptical when it comes to werewolves, although after all the weird crap that I've seen and experienced in my life I'm not prepared to dismiss anything outright. I have to admit that every time I go to Wisconsin I can't help thinking about werewolves. I just always get that feeling when I'm up in that part of the country...like if there was anyplace where they might actually exist it would be up there in the far north. The Native Americans have plenty of stories about wolf-like creatures that resemble or change into men. Anything is possible. There was a story about a wolf-girl who used to live here in Texas way back in the 1800s. I wrote a story about it here on the forum a few years ago. Of course she wasn't actually part wolf but just a human who was raised by them. It has been theorized that these large bipedal creatures migrate. I mean, let's face it. If you are an 800 pound bipedal animal, you are going to need a considerable amount of food to eat. But in Northern climes, like Wisconsin, there isn't a whole lot to eat come winter. So, in that train of thought, all you'd need to do is move about 500 miles south, and you'd be good to go. Just 20 miles per day for a month, gets you pretty much down south and out of the severe winter weather. Now, I bring this up for a reason. Animals that migrate follow certain paths every year. Birds, in particular, follow known routes, and a lot of them hinge on where rivers flow. If you follow the Mississippi river, it will take you all the way to the gulf. With that in mind, in the town I live in, we have a river that runs directly through it. Except for when it goes through the city, it is wild for several hundred feet on each side of it. I live next to the river and the land that borders it is deeply depressed, almost like a giant sinkhole. My house borders this depression, and the "sinkhole" runs for a few miles directly along the river. You can't build down there, it is swampy and bottomland that would have to be drained and stabilized, so it is very wild even as it runs adjacent to houses, businesses and other types of human habitation. Well, in the spring and fall, there always seems to be some major activity going on down there in the middle of the night. We have a path that goes down into this gully, and there are all kinds of deer carcasses, bones, skulls, antlers, and such, scattered about. I mean, sure, you might find a deer carcass in the woods now and again, but the amount down in this gully, next to the river, seems way disproportionate to the fact that this is in the middle of the city! Now, I have often wondered if this area is a highway, of sorts, for migrating bipedal animals. Dogman, Bigfoot, whatever, it is so full of vegetation down there that virtually any large creature, or creatures, could hole up on their travels, and no one would ever know. And it always seems that in the spring and in the fall there is the most activity. On many a spring night, I have sat out there with people at the top of the sinkhole, and you can hear movement, branches breaking, wood knocking, grunts, and just overall strange noises. but this stuff only happens in the spring and the fall. I have no clue as to what is going on down there, and at times, under the influence of medicinal spirits, I have been or have, propositioned friends to spend an entire night down there in a tent during the spring, but so far there have been no takers. LOL And so it goes. This theory is really interesting to me. and then imagine the things that can move with stealth. while searching yesterday, found some interesting "critters". Daeodon, archaeotherium, amphicyon species . . . If anyone could make a case that any of those creatures could walk on hind legs, at least part of the time, either of them could be hold outs from their era and potentially be a Dogman, especially the bear-dog amphicyon. There are other potential hold outs that may also be strange and unknown creatures. For example, the shunka warakin, or Ringdocus as it is also called, may be a relect Borophagus, or a North American hyena. The Nandi Bear in Africa has been possibly identified as an extinct Chalicothere, and some sea monsters closely resemble the ancient whale Zeuglodon. So, Jcurio, you may be on to something there, no doubt! And so it goes. A new report makes it way to us from southern New York, where a man writes in to tell us that he and his fellow campers were attacked by a group of large, hairy, dog-like creatures. As if that wasn’t strange enough, he says that his terrifying brush with the beasts comes after a possible encounter with a UFO. I saw you on Finding Bigfoot, and I know you like investigating weird *bleep*, so I thought about you when something weird happened to me last week. Me and two friends decided to go camping in [southern] New York, up on [redacted] Mountain. There was a dirt road that runs right down the mountain and then off of it are a lot of smaller off road tracks that have some good camping spots. I don’t know if you’re really supposed to be camping there or not but there’s a lot of fire pits so people do it anyway. Anyway, we set up our tent and get a fire going, have a couple beers, and are bitching about our women, and the sun goes down. We all looked at each other because the woods got real quiet. You couldn’t even hear crickets. Everything just went dead quiet. It felt like there was a lightning storm coming because you could feel the static in the air and all the hair on the back of my neck stood up. Jamie started saying that he felt like the air was humming and then all of a sudden there was a real deep bass noise and this bright light in the distance that flashed up and lit up the whole woods. It looked like the light when a real big firework explodes for the first few seconds, but it lasted for probably a minute before it split up into 3 or 4 other lights and shot back down into the trees. We could see all the lights glowing out in the woods and then there was a big gust of wind and it was gone. Everything smelled like it had just rained but it never did. We didn’t know what to do but figured we would just wait it out, but nothing happened. We thought maybe it could have been a meteor or something so we left it alone and went back to bitching about our women. At about 2 in the morning we decided to turn in so Jamie and I went to go sleep in the tent, but Dan said he was going to sleep by the fire. An hour later I wake up because Dan is in the tent shaking us saying that there is something big watching the camp. He said it was about 50 feet from the fire and he thought that it might be a bear but that it was standing on two legs and bobbing back and forth like it was trying to get a better look at him. While he was talking we heard a loud scream. I’ve never heard anything like it before as long as I’ve been alive. It sounded like a pig being slaughtered, but deeper, and so loud it made your ears ring. Next thing I remember was hearing 3 or 4 more things come running toward the camp site and the embers from the fire kicking up and landing on the tent. The things, or creatures, or whatever they were, kept running up to the tent and grunting and running back into the woods. Every once in awhile one of them would scream again and pull on one of the tent poles, dragging the whole tent a foot or two. The tent was collapsing on one side and we didn’t know what else to do, so we just started screaming as loud as we could. Only took a a minute and then everything was quiet again, so we made a run for the truck as fast as we could and hit the gas. When we were leaving we saw one of those fuckers in the headlights standing in the road. I told Jamie to gun it and the thing straightened up and puffed up its chest. It must have been 8 feet tall. Had dark gray hair all over its body except the front. That [hair] was white or yellow around the chest. Its face looked kind of like a dog but not really. I know what Bigfoot looks like and this was way different. It didnt even move when we drove at it. We had to swerve around it or we would have run right over it. We drove back down the mountain to the highway and parked the truck in a gas company parking lot. We were going to go tell the cops what happened but we didn’t know if we were camping somewhere we shouldn’t be, and we had been drinking all night and can’t afford a DUI, so we just waited for the sun to come up and sobered up. When we drove back up to get our stuff there wasn’t anything there. Everything was gone. No tent, no cooler, nothing. We told some of our friends what happened and they wont believe us since we’d been drinking so we just decided to forget about it. If you want to come check it out I’ll take you right to the place it happened. Theres still tracks from where we peeled out and lots of big gashes in the dirt where the tent was but nothin’ else. I don’t know if it had anything to do with the lights we saw but it was the weirdest damn thing any of us had ever experienced. That was no bear. A pack of upright canids attacking a campsite after a UFO sighting? Pretty wild. First off, let’s address the alcohol. Yes, it’s easy to lean back and laugh about how a bunch of drunk dudes saw a monster, but when was the last time you hallucinated from drinking beer? I’m not saying they couldn’t be mistaken, just that I doubt alcohol could make three people all hallucinate a physical attack by big hairy monsters. While he doesn’t explicitly call the creatures by the name, it sounds like the witness is describing an encounter with “dogmen”. These encounters happen a lot more than you might think, in fact, Michigan and Wisconsin are pretty famous for rashes of dogman sightings. Michigan even has an entire conference dedicated to the creature. New York isn’t uncommon for the occasional dogman report, but they don’t usually come along with sightings of strange lights. A UFO? The elusive “Green Flash”? Who knows..
We’ve taken him up on the offer to check out the alleged “attack site” in person, so we’ll do our best to get to the bottom of the case when we get boots on the ground. 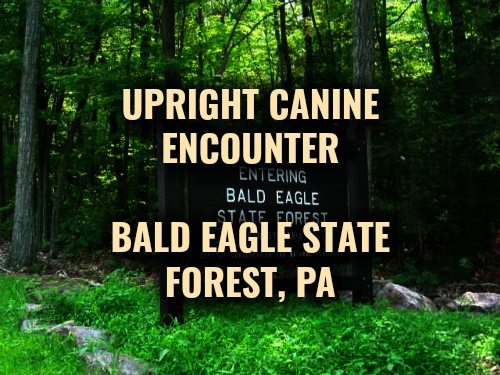 A resident of the Weikert, PA area a friend were on a designated hiking trail in the Bald Eagle State Park when they heard something walking to their right in the woods as if following them. They looked on several occasions in that direction but saw nothing and continued to hear the noise as if something was walking parallel to them. Their first thought it was a deer but the substantial noise made them second guess it could be a bear. The one gentleman was armed with a .40 cal Glock pistol so they continued and heard a sudden stopping of the noise. They stopped to look around and there was nothing visible to their right or left. They turned around and behind them at approximately 50 yards stood a large animal they first thought was a bear standing on its hind legs but quickly realized it was not a bear. Witness Description: A large wolf like head with short pointed ears, long muscular human like hands, massive chest and very thin around the waist area. Muscular legs and from the knees down what looked like a dogs hind legs. It's coat was very short and dark brown. (could have been black but looked brown) It made no movement toward them but just kept staring with what is described by witness as bright yellowish eyes. They started back to the area where they left their car and looking behind constantly but it was not there but it was following again to their right and there was noise as before emitting from the woods. Upon arriving at their vehicle there it stood in the tree line watching them and stayed was still there as they left the area. The one witness who made the report works for the DCNR and marks out damaged old growth trees to be cut and trees blocking pathways hiking trails and fire lanes to be removed. He would like to remain anonymous because of his job but left a contact if I needed more information. His companion is really shaken up and would rather never discuss it. Very scary .. I would not want to be in the woods and encounter this creature. So, I NEVER believed in the supernatural, until I was like 18. Me and my friends played with a Ouija Board (story for another time). Anyways, after the ensuing craziness from that escapade, I'm a full on believer. On with the actual sighting. I live in a very rural part of Mississippi. I believe my town has something like 247 people in it. Everybody knows everybody. Weird things have happened before, like animals being slaughtered or going missing, that sort of thing. Naturally we chalked it up to coyotes or other critters. I'm an avid hunter, so I was heading out to the woods with my bow, a fully decked out Matthews Creed. I got out a little earlier than usual, so it was still pretty dark. I've never minded the woods before, so all I planned on doing was relaxing in my stand for a while as I didn't feel like stalking today. It's not too far away from daylight, so the birds and other wildlife are starting to make their morning calls. Usually pretty peaceful, right? I swear to God, in the span of a second, everything in that patch of woods shut up at the same exact time. Dead silence. It didn't even try to be subtle, that alone scared the *bleep* out of me. So naturally my scared self froze, and just listened for anything. My first thought was, 'Oh *bleep*, something's out here with me', which freaked me out even more. Then I started to think maybe it was just a bear or a bobcat, which I still was terrified to meet up with, but at least it gave me a logical answer. I figured I could hear a bear coming, but I knew big cats were renowned for stalking people without their knowing, which scared the daylights out of me. I decided to keep moving towards my stand, post up, and just point my bow down the tree. After what seemed like forever, I freaking made it. I shuffled up the stand, pulled out my knife just in case, and just listened. Dawn was definitely breaking now, which made me feel better. Still no sounds of wildlife, which was getting more and more eerie. Now, my stand is perched on the side of a creek. The creek wasn't very deep, like maybe to the top of your ankle. About the only sound I could hear was the slight noise of the running water.Then I hear something to my right, and it is running fast. I instantly raise my bow and wait. It's getting louder and louder, closer as well. I almost screamed when I saw this *bleep*. It literally looked like something out of 'Dog Soldiers', only more muscular. This thing busted through the brush, ran down the slope and through the creek, then disappeared on the other side. I have seen some *bleep*, let me tell you, but I was shaking like a newborn babe. I didn't ease off my drawstring for like 10 minutes, which is a LONG time to hold a bow, FYI. I mean, this thing was HUGE. Like, 6'5-7'5, 250 pounds of 'NO!' And I've seen bears and the like before, they do not run like that. Dog-Men Vs. Kangaroos: A Connection? There’s no doubt that one of the biggest mysteries of the last couple of decades is that of what have become known as Dog-Men dogmanencounters.com/wisconsin-encounters/ . Basically, it’s a modern day term for what most people would call a werewolf. In the old tales and legends (which have been welcomed with open arms by Hollywood on countless occasions) the werewolf is a tortured soul, cursed with having to live the life of a monster as a result of being bitten by another werewolf. The change occurs when the Moon is full. And, of the various ways available to kill a werewolf, a silver-bullet or several is said to be the most successful. Of course, this is very much based on folklore and mythology. But, what of reality? And, what of the Dog-Men? It often comes as a surprise to many people when I tell them that there is hardly a case on record of anyone seeing a person becoming a Dog-Man. Or vice-versa. And of the small number of such cases that are on record, they are very much open to interpretation and highly controversial. Indeed, several such cases in my files are clearly hoaxes and nothing else. The fact is that almost all of the people who report Dog-Men encounters describe seeing what, in essence, appears to be a large wolf which has the ability to walk on both four limbs and two limbs. And, for the most part, there is zero talk of these things changing form. So, what could these creatures be? There is, however, another issue to all of this. As I said above, I do believe there is a real Dog-Man phenomenon – even if I don’t know what its origins are. But, I also think that some cases might be due to misidentification. But, of what? Well, that’s a question that definitely requires an answer. Over the years, I have heard a few stories suggesting that some Dog-Man sightings in both the United States and in the U.K. may have been due to people seeing kangaroos and wallabies under fleeting, dark, circumstances. Now, some people might laugh at this theory, or even outright ignore it, but bear with me. In her 2010 book, The Michigan Dogman, Linda Godfrey addresses the kangaroo angle of the Dog-Man controversy, noting that “‘Roos do have upright ears and a long face with muzzle, and they get around in an upright position, although they hop rather than run.” Kangaroos also have powerful, muscular front limbs and muscular chests too – issues which are often also brought up in Dog-Man cases. Now, it’s important to note that Linda does not conclude that the Dog-Man controversy can be explained away by mistaken identity – of kangaroos or of smaller wallabies. But, if you were to see an upright kangaroo – let’s say when darkness has fallen – partially hidden by trees and bushes, and which remains motionless, you might well think you had seen a Dog-Man. Consider this particular photo, and then consider seeing this animal briefly and in poor light, and with the tail out of sight. Might you think you had seen a Dog-Man? Possibly, yes. It’s also very important (and relevant) to note that reports of wild kangaroos and wallabies roaming in the United States are far from scarce. See this link and this one, too. So, in closing, I don’t think this is the answer to the genuinely weird aspects of the Dog-Man enigma. But, maybe a few cases? I would not be at all surprised. One type of mysterious creature that has gained a bit of a following in recent years is what is commonly referred to as the “Dogman.” Much as its name suggests, these entities are usually described as being very tall, bipedal, and covered with shaggy hair much like the more well-known Sasquatch, but in this case they also have pointed muzzles and features of a very canine nature. Spotted in many regions of the United States, the Dogmen are a bizarre phenomenon that manages to teeter where the lines of Bigfoot, Werewolves, the paranormal, and urban legend intersect, yet taking things deeper into the strange are the various reports that suggest these beings utilize the mental power of telepathy as well. Tulack has relayed interesting information to me, the most obvious is that they don’t think like humans. They understand their place in the forests and they don’t put out their threatening stance to other animals in the forests except when they hunt. As far as how they interact with each other, he stated that they have an understanding with each other. He preferred his solitude and said he particularly didn’t stay with any group but knew where they roamed. He was to me obviously intelligent beyond just a beast in the woods. He distrusted people extremely as do most Cryptids. He didn’t go into more detail than this but I’m pretty sure that what we see on TV with Werewolf movies isn’t even close. Tulack said that he and the large brown bear have been palling around for years. People put human issues and temperaments to other creatures and beings that have nothing to do with them at all. Very few people understand what courage really is. Courage is not about facing a werewolf, because I have visited with a werewolf in a sighting area more than once. Courage is not about traversing through dogman areas with guns and ammunition, because I have visited Dogman territories numerous times, always alone and unarmed. If I am not worthy to be here, then the dogmen can have me, but I have yet to experience aggression from them, and have had several subtle encounters with dogmen. I have recently discovered a 3-toe paw print that was almost as big as the palm of my hand, and was so fresh, that the dog man could have been watching me as I passed by. Most people are trapped inside the bubble of their own existences. I reach out to the life around me. I don’t write books nor am I well known. I’m a bachelor that lives a very quiet and private life, and one of things I love to do, is to get acquainted with the unknown. Anger, fear and arrogance rarely wins anyone friends that are truly trustworthy. The kind of feelings that you emit from your life force are the same ones that are going to be attracted to you. I have literally had dogmen approach me after dark, announcing their presence with sounds that defy what you would reason as being from average animals. I have heard mystical heavy breathing sounds, to non aggressive growls of acknowledgment. I even had a dogman creep up on me for 15 minutes that I was aware of the entire time, and when I sensed that it was very close, perhaps right behind me, I had a black and white telepathic image of a canine head and snout that came into my mind. It’s an amazing world. If given a choice between passing through cryptid territory or gang territory, I would choose dog men and big foot over humans any day. I have walked through dog man territories in Pennsylvania before, without fear, because I trust them, with a kind of trust that I don’t often have for humans. There are very few people in this world I would genuinely trust. I know just how arrogant and angry spirited people can be. I know quite a bit angry about my own kind, and am far more interested in knowing more about cryptids and protecting their habitats from further human development and destruction. When it comes to ESP I have heard people talk about perceiving the Dogman in ways other than through the regular five senses. Many talk about the creature sending them a message telepathically about not to talk about their sighting or else. Many talk about having a distinct gut feeling when these things are around and some even say they have been “sight-jacked”, as in them seeing through the eyes of the Dogman and most likely vice versa. I definitely sensed something was in that grove below the fence. Something very, very bad. I felt it like a thousand needles on my skin and a horrible paralysis and heavy fear overcame me, which seemed to be projected onto me by someone or something else. I heard my own voice in my head (higher self?) say “Go inside, do not run”, twice. Inside, after calming down a bit, about 10 minutes later, I opened the window and almost immediately heard a godawful howl from the cemetery a block away. The window was closed again really fast. I have also felt them “in the ether” as I call it while studying this subject. I perceive it as “tentacles of energy” searching through the ether, searching for the one searching them…The more I read and studied, the more I could perceive them coming closer. Sometimes I took breaks when I felt them coming too close. While working on those maps of dogman sightings two years ago, things got really intense for a long time. Months of reading about and mapping dogman reports for at least 16 hours a day. I felt the “tentacles”, I ignored them, I wanted to finish the maps. One day there was a connection made. I could feel it so distinctly. Contact. They had found me. Luckily I understand that they had only found me mentally. They still didn’t know where I physically was. Yet, after this experience I have become more afraid of the dark. I had some weird experiences with a mirror in my bedroom that I finally had to get rid of. I don’t really dare look out a window at night any more. I sometimes force myself because I will not live in fear of them, but damn it’s hard now. Also rather ominous in a sense was the account given by Bigfoot and Dogman researcher Parker Duvall on an episode of Coast to Coast AM called “Bigfoot and Dogman,” with host Connie Willis. Duvall has spent years studying the Dogman phenomenon in his home state of Kentucky, and told Willis that he had made telepathic contact with a Dogman named “Rawjer” and has created a relationship with the entities. According to Duvall, the Dogman are a warrior-like race that utilize an ability to fill humans with terror and a “primal fear,” as this is apparently the state in which people learn the most about themselves. He also sent the program several images of what he claims were of one of the Dogman and a couple that were of the aftermath of Dogman attacks on livestock. You can see the images here and listen to the program here. It is hard to know just what to make of such accounts or to discern just how much truth any of these may have, but they certainly do add a new weird dimension to the already rather bizarre phenomenon of the Dogman. These creatures are quite entrenched in the outer fringes of cryptozoology, seemingly defying any sort of biological explanation as it is, and these accounts of weird telepathic abilities further make this an area in which we largely have no idea of what we might be dealing with. Whether we are looking at Werewolves, thought forms, demons, ghosts, or something else entirely, the Dogman phenomenon most certainly seems to just get odder and odder, and shows no signs of waning.